Enjoy your evening...still red hot here!!!!!! A perfect LIM card, love the image..
Wow Sylvie. The scene you've created is beautiful!! Thanks for visiting my blog and your kind comment :)! I think your card is gorgeous, lighthouses are so romantic! 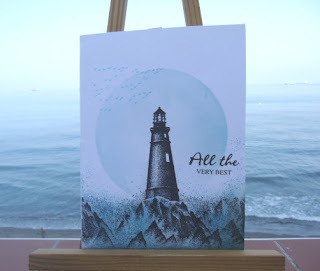 You have a beautiful blog and you make lovely cards, I especially loved the one with the poppies! WOW what a stunning card Sylvie. Beautiful card Sylvie..love your stamp. Just beautiful Sylvie... I love these stamps and you use them so well! Thank you so much for another fabulous submission. You are fast becoming an expert on the LIM challenges!!! Another great card. Jealous you've got it red hot there - although it has been sunny and warm today we've had so many days of damn, grey weather! I am off to Ally Pally in September I'm going on the Saturday - what day will you be there? We will have to arrange a meet up to say hello and to meet in person - which would be lovely! Have a great weekend and catch up later! what a coloring, your card has so much expression! Beautiful card! Thanks for stopping by my blog and leaving a nice comment. I appreciate it very much.